Amnesty Says U.S.-Led Coalition May Have Committed War Crimes In Mosul : The Two-Way The forces aligned with Iraq's government allegedly used crude, imprecise weapons that caused an unnecessary level of civilian casualties in the fight against ISIS, the U.K.-based rights group says. Airstrikes target Islamic State positions on the edge of the Old City on Tuesday, a day after Iraq's prime minister declared "total victory" in Mosul, Iraq. Amnesty International is accusing the U.S.-led coalition of potentially committing war crimes against civilians as it fought to wrest control of the Iraqi city of Mosul from Islamic State fighters. It says ISIS definitely committed war crimes there. The forces aligned with Iraq's government allegedly used crude, imprecise weapons that caused an unnecessary level of civilian casualties, the U.K.-based rights group says. "The scale and gravity of the loss of civilian lives during the military operation to retake Mosul must immediately be publicly acknowledged at the highest levels of government in Iraq and states that are part of the US-led coalition," Lynn Maalouf, Director of Research for the Middle East at Amnesty International, said in a statement. 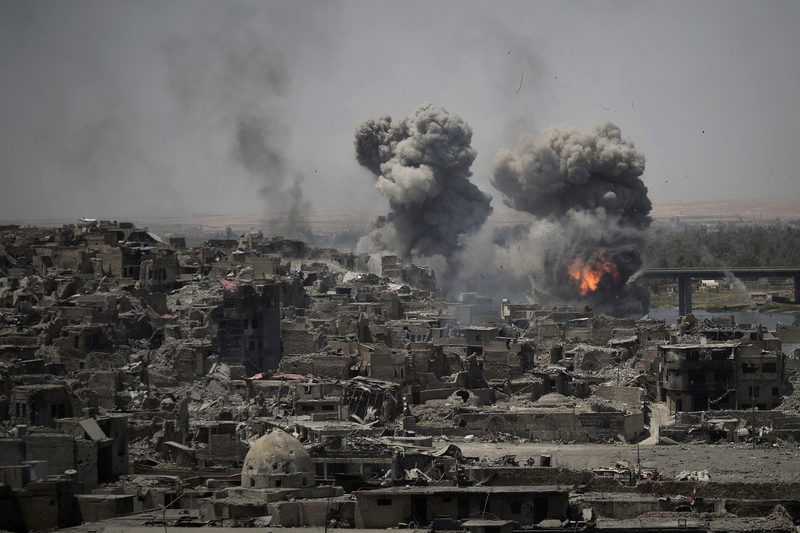 The report says the number of civilians killed by attacks launched by Iraqi and coalition forces in Mosul from Feb. 19 to June 19 is at least 3,706, citing numbers from the Airwars monitoring group. IS has summarily killed "hundreds, if not thousands" of people trying to flee, Amnesty says. This week, Iraq's Prime Minister Haidar al-Abadi declared victory in Mosul, which has been under ISIS control since the summer of 2014. The offensive to take back the city began last October, and west Mosul was the last remaining ISIS stronghold there. As ISIS fighters lost territory, they would force civilians to act as human shields in the dwindling areas that they still controlled, resulting in a densely packed area, the report says. "Did they [pro-government forces] try to hit IS targets? IS was with you, in your house," says an outraged west Mosul resident quoted by Amnesty. In the fight for east Mosul, elite Iraqi Counter-Terrorism Service troops fought on the ground with limited coalition airstrikes that primarily used precision-guided munitions, according to Amnesty. Casualties were high among the Iraqi troops, with some estimates of up to 75 percent of the force killed or injured. Tactics changed in west Mosul, which Amnesty attributes to fewer highly trained Iraqi forces available to fight. The rights group criticizes the choice of weapons used in west Mosul, including Improvised Rocket Assisted Munitions (IRAMs) – described by Amnesty as "inherently indiscriminate." "With their crude targeting abilities, these weapons wreaked havoc in densely populated west Mosul, where large groups of civilians were trapped in homes or makeshift shelters," the report states. "Even in attacks that seem to have struck their intended military target, the use of unsuitable weapons or failure to take other necessary precautions resulted in needless loss of civilian lives and in some cases constituted disproportionate attacks." "I'll tell you that, from the way we do our airstrikes, we use the most precise and discriminate weapons that we can ever use and are available in the world to avoid targeting civilians. We have direct control and conversations with the Iraqis minute by minute on exactly what's happening on the ground, and we have an unprecedented number of unmanned vehicles over the top of the fight to see exactly what's happening. And I'll tell you, if there's ever a doubt of whether or not there's a civilian involved, we will not strike." He adds that civilian casualties are "going to happen, just based on the nature of the war, but I can tell you that to be effective we've got to support the Iraqi security forces and that's what we've done." Amnesty says that it documented 426 civilian deaths in 45 attacks in west Mosul that it has "reasonable grounds to attribute to Iraqi government or US-led coalition forces." Retired Air Force Maj. Gen. Charles Dunlap, now a professor at Duke Law School, questions Amnesty's claim that coalition forces may have committed war crimes. "The law – which even in this context carries, as Amnesty International should know, a presumption of innocence – typically demands evidence of the attacker's beliefs and intent before ascribing criminal liability. I didn't see much of that in the report," he says in an email to The Two-Way. "Amnesty International may think that the pro-government forces did not take all feasible precautions, but they are in no real position to say what was or was not, from the commanders' perspective, feasible under the complex circumstances of this offensive. "In a perfect world more highly-trained counter-terrorism units in the pro-government forces might have obviated the need to use mortars, artillery or even airstrikes in some situations. But in combat, the ideal is not always available. The Iraqis had to go with what they had, and do the best they could to free the city while limiting the harm to civilians." Amnesty interviewed 151 west Mosul residents for its report, who describe being trapped there by ISIS. Many risked being executed by ISIS to flee through the front lines of fighting. "We did not have any options," says a Mosul resident quoted by the report. "If you stayed, you would die in your house from the fighting. If you tried to run away, they would catch you and kill you, and hang your body from the electricity pylon as a warning."